Major League Baseball has selected the longtime-comin' Boston Red Sox World Series win in 2004 to kick off their new (hopefully) yearly multi-disc collection of playoff/series games in their entirety. This hefty 12-disc set is a massive thing, with each game relegated to its own disc, with the 12th housing all of the extras. There's seven games between the Red Sox and the Yankees for the ALCS, followed by the four World Series games against the Cardinals. That's a whole lot of exciting baseball and history rolled into a sprawling boxed set, and though I question who might actually sit through all these games again, there's no arguing that The Boston Red Sox 2004 World Series Collector's Edition is the kind of thing that looks substantial sitting on a shelf. I can only imagine how I'd feel if it were the Cubbies. The games on this set are all lifted directly from the Fox television broadcasts, though they're not in HD, nor are they presented in widescreen or 5.1 surround, and the only thing missing that's a positive of any kind is the ten million commercials, though we still get the "sponsored by" mentions at the start of each game, so it's just as if you TIVO'd the games and burned them to disc, minus the ads. The cover for each disc is crammed with wonderfully relevant and obscure info (for example in Game 3 of the ALCS: 85 foul balls, game time temp 57 degrees, 60 first-pitch strikes), quotes, history, and a complete inning-by-inning/play-by-play breakdown of that particular game, as well as full box scores. It's almost sensory overload. Yet I think there is something inherently odd about releasing baseball games on DVD, because no matter how much I love and root for a team, the chances of me sitting down and rewatching games that I already know the outcome of is minimal, to say the least. Sure, in the case of Boston I might want to see the whole Curt Schilling/bloody sock thing again when I want to relive some of the bizarre, over-hyped moments of the 2004 baseball post season, or maybe I just want to watch Keith Foulke get the last out in Game 4 of the series on that chopper off the bat of the Cardinals' Edgar Renteria. But how often will that happen, really? The thing is that this isn't about simply rewatching Boston battle through the ALCS and the World Series. It's about owning it. It's catching a part of what makes baseball so exciting, attempting to bottle the magic and hold it in your hands. It's sleeping well with the peaceful knowledge that as a baseball fan, should you ever want to revisit that moment again—every pitch and every at bat—all you have to do is pop in a DVD. There is an inner satisfaction, something almost romantically primal that runs deep in the gut of all baseball fans, a pure love-of-the-game moment that just feeling the heft of this set can bring to the surface, even if you never watch one of these game ever again. That's what baseball can do to people, and the folks at MLB know it. Image Transfer Review: The games are all shown in 1.33:1. There appears to have a minor mastering problem, apparently from the video source, as some of the games have a thin line of interference across the very top of the screen. It's hardly noticeable, but once I saw it my eyes were drawn to it. That unsightly production issue seems a big gaffe, but colors look as natural and bright as they did during the original broadcast. Audio Transfer Review: All the games are presented in 2.0 stereo, which is kind of a cheap reverse move from the 5.1 broadcast quality when they originally aired. The announcers sound clear, you can still hear the crack of the bat and the crowd, but there's something that a full-blown 5.1 surround mix can do to a live sporting event that 2.0 stereo can't come close to recreating. The quality of the stereo track is serviceable, but it really could have been so much more. Extras Review: Most of the extras—all of which are found on Disc 12—are lightweight filler (do we need to hear five minutes of David Ortiz talking or see Curt Schilling speaking to the fans? ), but the official 2004 World Series Film (01h:31m:00s)—narrated by Denis Leary—is the thing to watch. It's a full-tilt look at the road to the series, covering the team from all angles, isolating key moments and condensing everything down to 91 nail-biting minutes. Each game has a chapter per half inning. 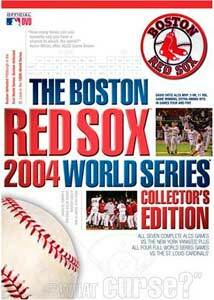 This 12-disc set is a veritable whopper, containing all seven Red Sox vs Yankees ALCS games, all four Red Sox vs Cardinals championship games, and an extra disc with everything from fluffy stuff like Johnny Damon shaving his beard to the official 91-minute MLB 2004 World Series film, narrated by Denis Leary. I'm not sure of the replay value of a set like this for those of us outside the Red Sox Nation, but it is still a towering bit of baseball goodness. Let's hope the Cubs get one of these in my lifetime.